Not for the first time my husband and I made the killer four day trip from central California to Fort Smith, Arkansas and back. As usual, I had my camera and cell phone along. I do what I call "roadside photography"--I take pictures out the window of scenery or cloudscapes that intereste me as we are zipping down the highway at 70 mph or greater. As I near a city or town, as soon as I get tower, I get on my cell phone and start looking up the history of the area. After all, there are some pretty desolate stretches along I-40. What possessed people to move there and make it their home? Traveling west the next day, we drove through stormy weather, but, thankfully, no tornadoes. As we approached Tucumcari in eastern New Mexico, the sky was overcast, but there was no rain. I searched my cell phone's internet for the history of Tucumcari. The city was named after the mountain next to which it is built. I looked around, and the land was fairly flat with the exception of one tabletop mountain. I quickly grabbed my camera. Only problem was, the mountain was on the driver's side of the car. I did my best to get a few shots out the front window, hoping the bug splatter and dashboard reflections on the glass didn't mar the images. Then after my husband rolled down his window, I leaned across and, with the camera in front of his face, took a few more snaps. Tucumcari Mountain was once referred to as Tucumcari Peak or Mesa Tucumcari and is regarded as a mesa rather than a mountain. 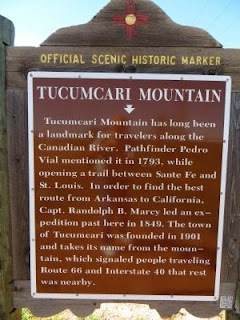 Tucumcari Mountain has long been a landmark for travelers along the Canadian River. Pedro Vial mentioned it in 1793, while opening a trail between Santa Fe and St. Louis. In order to find the best route from Arkansas to California, Capt. Randolph B. Marcy led an expedition past here in 1849. The legend has been handed down word of mouth by the Native American tribes: Wautonomah, Chief Apache, knew he would soon die. He was troubled over who his successor would be. His two finest braves were Tonopah and Tocom, enemies and deadly rivals for the hand of Kari, Wautonomah’s daughter. But, Kari loved Tocom and hated Tonopah. The two rivals met and hurled themselves upon one another in deadly combat. Unknown to either, Kari had concealed herself nearby. As the knife of Tonopah found the heart of Tocom, she rushed from her hiding place and plunged her knife into the heart of Tonopah. Then, taking Tocom’s knife, she stabbed herself in grief. When Wautonomah was lead to the scene, he was heartbroken. 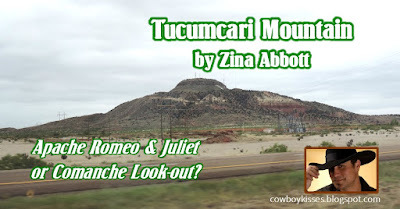 Seizing Kari’s knife, he plunged it into his heart, crying in agony, “Tocom-Kari.” The old chief’s dying utterance lives on today but with the slight change to “Tucumcari.” The scene of the tragedy is the now famous Tucumcari Mountain. “Every morning Herman Moncus had a ten-minute spot on the local radio station. He collected all sorts of old artifacts, and on that show, he talked about the latest relic he had collected. “Every day, the old timers and the Chamber of Commerce people would gather at Moncus’ drugstore and talk. 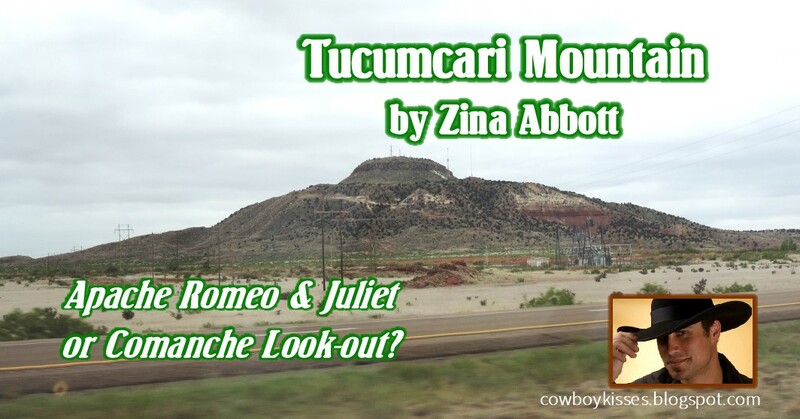 One day, they decided to build an Indian village on top of Tucumcari Mountain. They stretched rawhide over old tepee frames and seeded the area with old Indian arrowheads. All this was done to attract tourists. 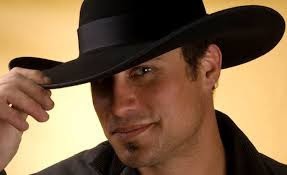 “You mean the Legend of Tucumcari is not true?” Phillips said unbelievably. “Just one big lie,” Crocker answered…. Tucumcari Mountain as seen from the west. 1. It may have come from the Comanche word "tukamukaru", which means to lie in wait for someone or something to approach. 2. A 1777 burial record mentions a Comanche woman and her child captured in a battle at Cuchuncari, which is believed to be an early version of the name Tucumcari. 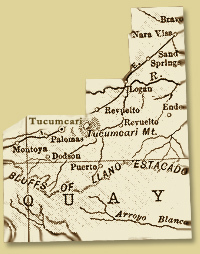 Perhaps the most credible source for the name, and certainly the earliest, is found in the diary of Pedro Vial published in 1794 in which he mentions travel past "Tuconcari", known today as Tucumcari Mountain. When not traveling through the Southwest, Zina Abbott has been writing stories set in the Eastern Sierra-Nevada California county of Mono. The first three novellas in the Eastern Sierra Brides 1884 series, Big Meadows Valentine, A Resurrected Heart, and Her Independent Spirit, are now available. He Is a Good Man was published as part of the Lariats, Letters and Lace anthology.